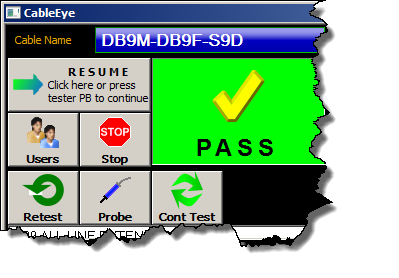 This optional 'simplified' GUI is suitable for performing complete cable and harness pass/fail tests such as might occur on the production line. The interface is compatible with Touch Screen operation, and isolates the worker from CableEye features and controls unnecessary to their assigned task. This Simplified Automation User Interface feature comes with all new CableEye products as part of Version 5.3-B1188 software. It is also available as a software update which may be purchased by itself (Item 726B), or downloaded for free from our Customer Support site with a valid Warranty. CableEye software running Version 5.3-B1188 or newer has this option available. Two 'simplified' views are provided, Basic and Plus, and present clean-cut information, ideal for workers on the production floor. To ready the Simplified Automation User Interface, qualified personnel/administrator prepare Automation Scripting through the automatic test window (macros) of the main CableEye software. This customized Automation Script may be saved to the desktop as a shortcut to be used on production workstations. Production workers launch the Simplified Automation Screen from the shortcut on their workstation ... which may be a Touch Screen Computer ... and initiate the test sequence embedded within. 1 - The CableEye screenshot on the right shows how to enable the Simplified Automation Screen in a simple macro example. 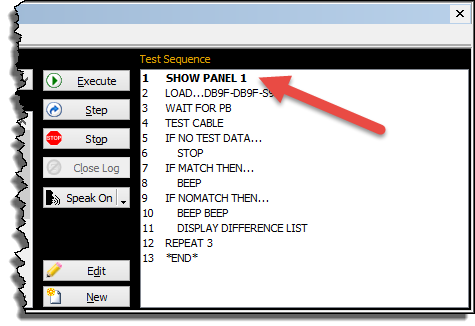 The first instruction "SHOW PANEL" activates the new screen, and you can easily add this instruction to every macro in your database. 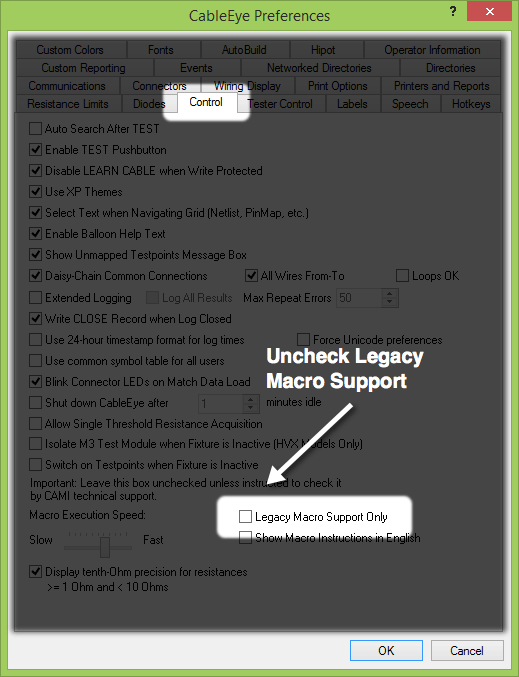 2 - Note: Older software requires you to disable "Legacy Macro Support Only" from the Preferences / Control menu. In the preferences menu, go to the Control tab and uncheck Legacy Macro Support Only, as shown in the screenshot in the right. 3 - To create a macro executable shortcut, simply duplicate the CableEye icon in your desktop, then rename the new icon and right click on it to select Properties. Finally, add the following at the end of the Target field: "MacroName.mac /exec". Replace "MacroName" with the name of the macro that you want to execute with this shortcut. Enjoy the increased flexibility offered by our Simplified Automation Screen feature on your production floor today! ... nothing but positive reviews from our Quality department and more importantly from our customers. We have used our CAMI CableEye test equipment for over three years. We routinely use it to test over 1,000 test points on an aviation harness and have nothing but positive reviews from our Quality department and more importantly from our customers. The reliability of the equipment allows us to provide our customers with the best possible products. We've also found that the customer service and response time from CAMI Research to be excellent. All in all a company I would highly recommend using. Galaxy Wire and Cable, Inc.